Sometimes there is magic in a space…. One of my students mentioned that despite all her fears she feels safe at the KULA, and when her husband asked why, she said: I feel safe with Nancy; if anyone bad comes, she’ll just NICE the devil right out of them! I laughed out loud when she said that. She laughed too. And we hugged, of course, because that’s what we do. I can’t stop thinking about what she said. So many of us come to yoga from a desire to heal, to feel loved, to find acceptance. Most have experienced trauma in one form or another. It’s easy to get caught up in the fairy tale world of a mystic practice where we can wish evil away by thinking good thoughts and showering everyone with love. Not that those are bad things to do. It’s just not that easy. Turns out love isn’t really all you need; there’s more. In time we must face the demons so we can transform them. We must walk through the fire and confront who we are. When we reach that point, if we don’t feel safe, we can’t do the work. It’s that simple. 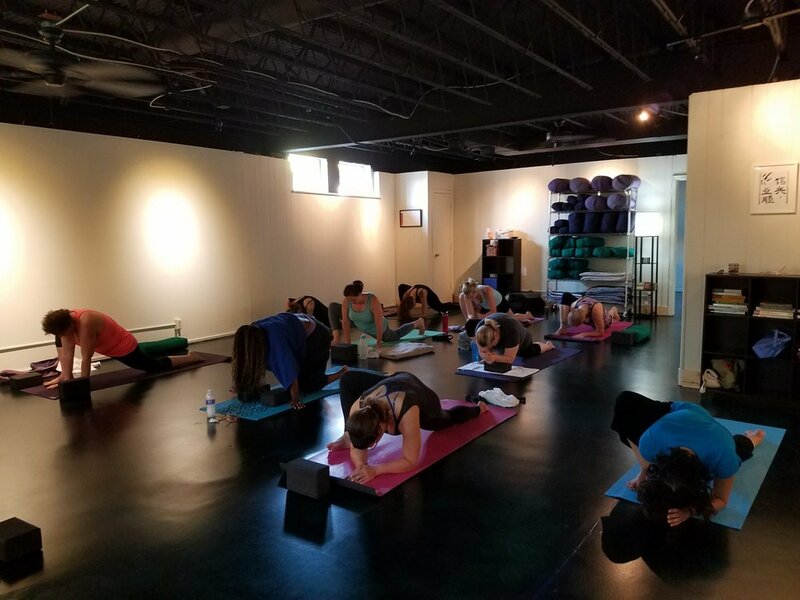 I wanted to create an environment of refuge and safety; I wanted to build a community and share in the practice of yoga. I envisioned a studio where people are inspired to believe in themselves, empowered to choose their path, and able to transform their lives. The work of yoga is the work of our life. When we’re in a space that feels safe and encouraging we succeed in being our best selves, and it feels like MAGIC. This Saturday: 10/28 Ashtanga at 10:30 AM Join us for our monthly Ashtanga practice! NO EVENING CLASSES ON HALLOWEEN – HAVE A SAFE AND HAPPY HOLIDAY!! Yoga + Bike with Sally Urdang - Saturday October 28: 4-6PM $15 - This is the first monthly Yoga + Bike event with Sally! Theming, Storytelling, and the Goddesses with Amie Rader – Saturday 11/4 2-4PM $25– Geared toward current teachers and teachers in training. Essential Oils 101 – Sunday November 12: 4:30-6PM – FREE information session and snacks with Nicole and Sally from doTERRA essential oils. Practicum classes – Our teachers in training will host their practicum classes Friday – Sunday 11/10-11/12. These will be public classes. We’ll be accepting donations for our November Charities: Give Back Yoga and the Veteran’s Yoga Project.